Emery Manville Hamilton (see biography of Emery Hamilton) was an impressive engineer and inventor from New York, with more than 20 patents in his name in various fields like telegraph, typewriter, time recording device, etc. His first invention, an adding machine, he patented in July 1871 (US patent 117169) (see the lower patent drawing). 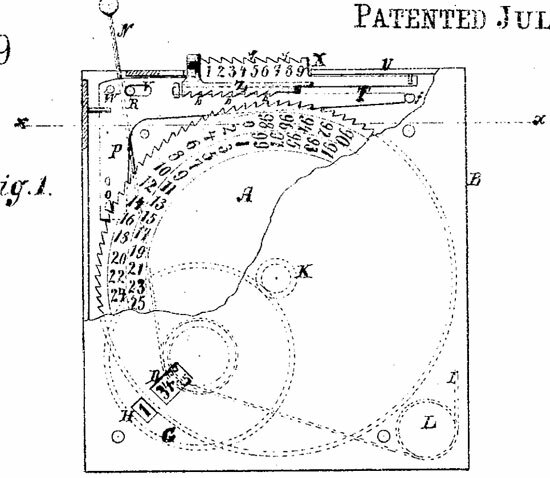 The machine was announced in the section for more prominent patents of the August 1871 issue of the journal Scientific American (Volume 25, Number 06). This is a combination of various devices whereby the operation of adding may be accomplished, the machine carrying and automatically registering the sum totals of the numbers set off upon it. We judge it will compare favorably with other competitors in the same field of Invention. Hamilton's adding machine consists of a large circular disk on a pivot in a rectangular case, having 100 notches and teeth in the periphery, which notches are correspondingly numbered on the margin of the upper side of the wheel. The operation is by means of a pencil, being placed in a notch, opposite the number on projection of the bell-crank, which to be added to the number seen through aperture, and the bell-crank being pushed inward thereby so that stud-pin is disengaged with it. Thus disk will be free to be turned by a spring, and it will move slide to the right until projection comes against the pencil resting in notch, when it and the disk will be arrested and, as the movement of the disk at he part having the numbers on it is the same as that of the slide, being the sum of the two addends.